The Johnsons were made to be a peculiar couple, called by a marvelous God. Dr.’s Michael and Kay Johnson have been involved in overseas missionary work since 1984. They were accepted to full time work with World Gospel Mission in 1989. Their ministry has taken them to several sites in Africa, including The Sudan, The Democratic Republic of the Congo (formerly Zaire), Ethiopia, Uganda; Kenya where they worked for 20 years, and short term work in Haiti. Their work in Kenya included working in mission hospitals (Tenwek, Kijabe and St. Mary’s), where Michael functioned as surgeon, and Kay’s responsibilities included administration and finance. God gave them the ministries of The Least of These, and A Prepared Place allowing them to work with a variety of indigenous Kenyan organizations. That work included providing food, clothing, and education and in-country adoption services for orphans. They were able to help build self-sustainable sources of food and water for rural populations. Their supporters helped fund the building of a full primary school and pay for secondary and college education for orphans. 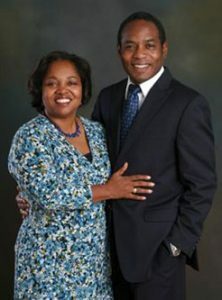 The Johnsons returned to the United States in 2010, and currently reside in Delaware. Their ministries now include healthcare for the ‘medically indigent’ in Philadelphia and counseling to the incarcerated. Michael serves as the medical director for the Hope Pregnancy Center in Philadelphia providing the resources to help women and girls make life affirming decisions. Michael attended medical school at University of Michigan, in Ann Arbor, Michigan, and Kay is a graduate of Walden University MBA program in Minneapolis Minnesota. During their 36 years of marriage, God has blessed the Michael and Kay with four (now adult) children and four grandchildren. Their home church is the Tasker Street Missionary Baptist Church in Philadelphia.